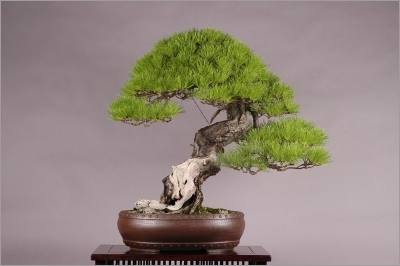 Japanese red pine is widely used as a bonsai tree. If left to grow naturally, it reaches 30 to 50 feet tall. A truly classic and beautiful tree for bonsai. A distinguishing feature of this tree is the often crooked or sweeping trunk which shows reddish-orange peeling bark; very showy trunk. The tree wants to grow with several trunks but can be trained to grow with a single trunk. It has soft bendable branches that tend to sweep upward. Needs little pruning to develop a strong structure. A cone-like evergreen tree with broad irregular head. In Japan it is thought of as 'feminine' because of the soft informal appearance. Soft bright blue green or yellow green needles are arranged in pairs and remain on the tree for about three years.